Learn how to mark your paper ballot cards and how to vote for local candidates using ranked-choice voting. To learn about specific candidates and measures on the ballot, visit the What’s On the Ballot page. To view your sample ballot, use the Polling Place and Sample Ballot Lookup Tool. 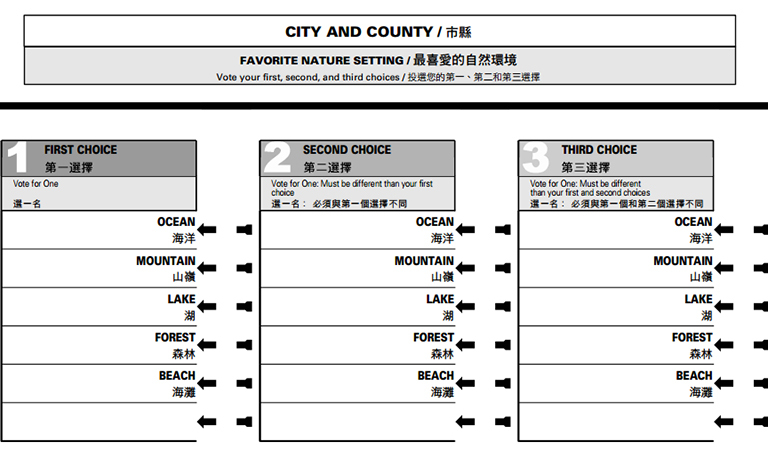 All San Francisco ballots are bilingual, each with content in English and one other language: Chinese, Spanish, or Filipino. Voters who have provided their language preference to the Department will receive a ballot in English and their preferred language. You will receive a paper ballot unless you request to use an accessible voting machine at your polling place or at the City Hall Voting Center. At the top of each ballot card are instructions on how to mark your selections for each contest that appears on that card. For each contest, the number of candidates you may select is printed above the list of names. 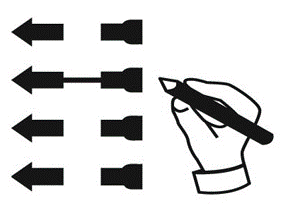 To mark your vote for a contest or measure, use a pen with black or dark blue ink or a #2 pencil and complete the arrow pointing to your choice. Be sure to fully connect both sides of the arrow to indicate your selection. You are allowed to vote in all contests for which you are entitled. If you do not want to vote on a certain contest or measure, simply leave that contest or measure blank. Your votes for the other contests and measures that you voted for will be counted. Please note, if you mark more candidates than allowed in a contest, or if you mark both “YES” and “NO” in a measure contest, your vote for that contest or choice cannot be counted. When you are finished marking your ballot, review both sides of each ballot card to make sure you did not miss any contests or measures on which you intended to vote. Do you vote by mail? Visit the Vote By Mail page for information about completing and returning your vote-by-mail ballot envelope. Ranked-choice voting allows voters to rank up to three candidates in order of preference for a single office. This makes it possible to elect local officials by majority vote without the need for a separate runoff election. Voters passed Ranked-Choice Voting as an amendment to the San Francisco City Charter in March 2002. To learn when these contests will appear on your ballot, visit the Future Elections page. For contests that use ranked-choice voting, the names of all qualified candidates are listed in three repeating columns on the ballot. Select your first-choice candidate in the first column to the left by completing the arrow pointing to your choice. To indicate a second choice candidate, select a different candidate in the second column by completing the arrow pointing to your choice. To indicate a third choice candidate, select a different candidate in the third column by completing the arrow pointing to your choice. Each column lists the same candidates in the same order. If you select the same candidate in more than one column, the vote for that candidate will count only once. You may – but do not have to – rank up to three candidates for each office that uses ranked-choice voting. If there are fewer than three candidates for the same office, or if you want to rank fewer than three candidates, leave any remaining columns blank. For more information, watch the ranked-choice voting instructional video or download a demonstration ballot. When results are tabulated, every first-choice vote is counted. If any candidate receives a majority, more than 50% of the first-choice votes, that candidate wins the contest. If no candidate receives more than 50% of the first-choice votes, the candidate with the fewest first-choice votes is eliminated. Voters who selected the eliminated candidate as their first choice will have their vote transferred to their second choice. The votes are then counted again. If a candidate has more than 50% of the votes, that candidate wins. If there is still no candidate with more than 50% of the votes, the process of eliminating candidates and transferring votes to the next-ranked candidate continues until one candidate has a majority of the votes. A qualified write-in candidate is a person who has submitted the required documentation to run for office, but whose name does not appear on the ballot. The only write-in votes that can be counted are votes for qualified candidates. A list of qualified write-in candidates (PDF) is available online approximately 10 days before each election. Copies of this list are also available at every polling place and the City Hall Voting Center. 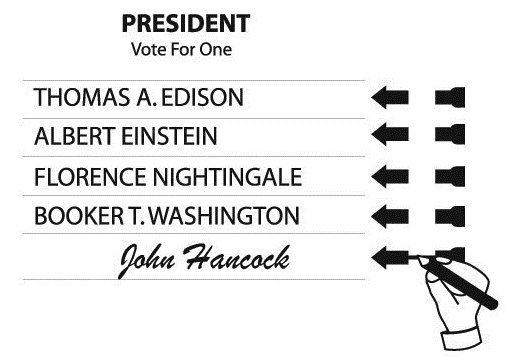 To vote for a qualified write-in candidate, write the person's name in the blank space at the end of the printed candidate list and complete the arrow that points to the space in which the write-in candidate name has been written.